Demand for industrial adhesives is estimated to extend across a wide spectrum of end markets, with transportation, inclusive of automotive and construction likely to take leading positions. A growing number of end-use applications have exhibited a marked shift from traditional mechanical fastener based technologies to adhesive based technologies, prominent among them being the automotive, mobile handheld electronic devices and medical sectors, which are expected to record faster than GDP growths over the coming few years. For instance, in automotive and aircraft manufacturers have initiated the substitution of conventionally used metals with plastics, composites and nonferrous materials in fabrication that helps in reducing weight of the vehicles and reducing fuel consumption. Traditionally, the global demand and growth for industrial adhesives has had a direct correlation with the chemical industry as a whole, which has averaged at about 3%-4% over the past decade. 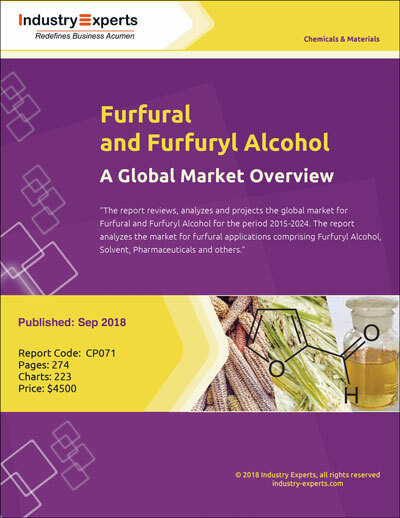 However, between the years 2008 and 2010, the global economy went into a tailspin, with a major proportion of industries following in its wake, of which the chemical industry was one. With end-users tightening belts and cutting down production due to lack of demand, industry majors had a torrid time in this recessionary period, and the market for industrial adhesives was also adversely affected. 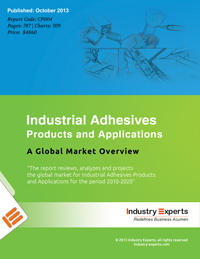 Industrial Adhesives application areas explored in this report encompass Pressure Sensitive Products, Packaging, Construction, Woodworking, Transportation and Other Applications. 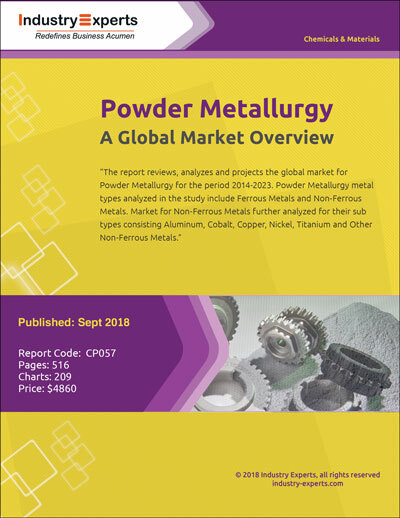 The report also analyzes the product segments including Acrylics, Water-Based PVAc & VAE, Polyurethane, EVA & Polyethylene Hot-Melts, SBC Hot-Melts, Epoxy, Polychloroprene and Others. The major product segments further classified in to sub-types as Acrylics - Emulsion-Based Acrylics, Solvent-Based Acrylics and Other Acrylics; and Polyurethane - Solvent-Based, 100% Reactive, Hot-Melt and Water-Based. 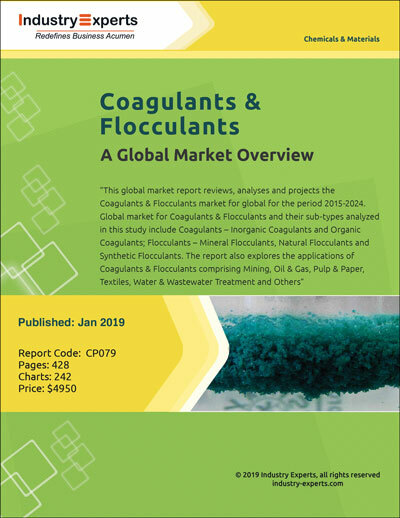 The global markets for the above mentioned product types and end-use applications for industrial adhesives are analyzed in both value in US$ and the volumes in million pounds (lbs). 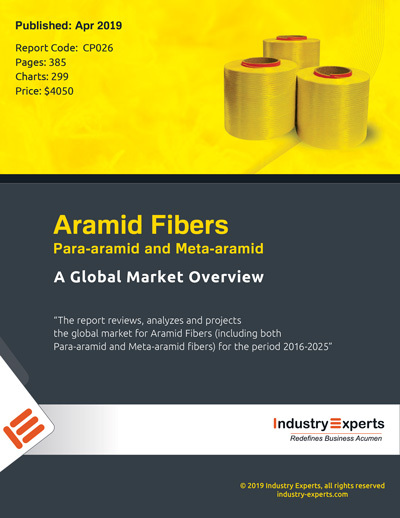 The report covers the global market for industrial applications only and excludes any other usages of adhesives. Pressure sensitive products accounts for the largest share of about 28% of global consumption of industrial adhesives equated to 5.9 billion lbs closely followed by Packaging with 4.7 billion lbs in 2013. Transportation projected to achieve the fastest 6.3% compounded annual growth rate (CAGR) between 2013 and 2020. The report reviews, analyses and projects the industrial adhesives market for global and the regional markets including North America, Europe, Asia-Pacific, South America and Rest of World. The regional markets further analyzed for 16 independent countries across North America - The United States, Canada and Mexico; Europe - Germany, France, the United Kingdom, Italy, Spain and Russia; Asia-Pacific - China, Japan, South Korea, India and Taiwan; and South America - Brazil and Argentina. This 787 page global market report includes 709 charts (includes a data table and graphical representation for each chart), supported with meaningful and easy to understand graphical presentation, of market numbers. 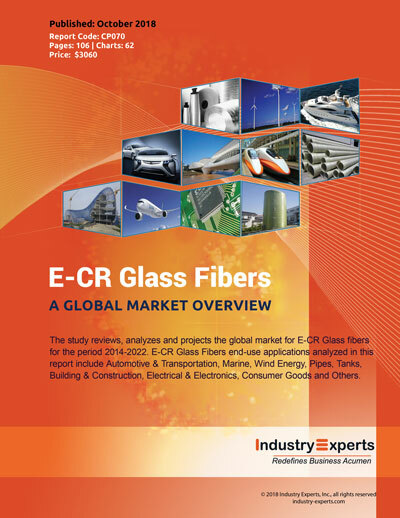 This report profiles 39 key global players and 92 major players across North America - 36; Europe - 17; and Asia-Pacific - 39. The research also provides the listing of the companies engaged in manufacturing and supply of industrial adhesives. The global list of companies covers addresses, contact numbers and the website addresses of 646 companies. Royal Packaging Specialities Acquired Adhesives Packaging Specialities Inc.
All contents of the market research report are protected by the copyright of Industry experts. The option for type of license is provided on the report page. Basically Industry Experts offer two types of licenses to the purchaser – Single User License and Enterprise License. The all original prices mentioned in the website are in USD and of a Single User License. The buyer must select the type of license for this electronic use agreement and it is considered that the buyer has accepted the following terms and conditions. Single User License – Use of the report under this license is strictly limited to the individual who is purchasing this license. Reproduction or sharing of this product in any form is strictly prohibited. Violations may result in a severe civil and criminal penalty. Enterprise License – The report can be used or reproduced in any form for the access to all employees of the licensee. The report can be printed or stored in a central retrieving system for the internal use. The licensee is responsible for the protection of the report from third party's access. Enterprise license will cost an additional $1,800 - $3,600 on top of the base price. No Refund Policy – We maintain a strict 'No Refund Policy', as the electronic (.pdf) form of the reports is easily transferable. We provide an extensive description of our reports on the website to give you the complete picture of the contents inside the report. It is recommended that you enquire before you place an order to buy the report, if you have any questions. Payments - Industry Experts is partnered with 2checkout.com for all payments. 2checkout.com is an authorised agent to collect the payments on behalf of Industry Experts. Alternatively, the company also accepts international wire transfers for the payments. Please enquire for our bank details if you are paying by bank transfers. Delivery - All deliveries will be done within two business days upon the confirmation of the payment.